The U.S. Federal Aviation Administration is taking too long to approve drone tests and isn’t looking far enough into the future as it prepares rules for commercial drone flight, an Amazon executive told lawmakers on Tuesday. Late last week, Amazon was issued permission by the FAA to fly an experimental drone as part of its tests for a planned automatic delivery service but it came too late, said Paul Misener, vice president of global public policy at Amazon. “The UAS [unmanned aircraft system] approved last week by the FAA has already become obsolete,” he said. As a result, Amazon has filed on Friday for permission to fly a more advanced drone—one that is already being flown in several countries including the U.K., said Misener, who was speaking at a hearing of the Senate Committee on commerce, science and transportation. Outside of the U.S., no country had taken longer than two months to approve any Amazon drone tests, said Misener, whereas the recent FAA approval took about six months to approve. “We’re allowed to innovate in other countries in ways that we cannot in the U.S.,” he said. The FAA is moving to make such approvals faster, said Margaret Gilligan, FAA associate administrator for aviation safety. Indeed, earlier in the day, the administration started issuing blanket airspace approvals for flights under certain conditions. Gilligan said the FAA was moving more cautiously than regulators in other countries because the skies of America are busier. Partly as a result of fewer regulations on flight, private aviation is a much more active field here, and that means greater risks when drones enter the airspace. The FAA recently published proposed rules that would remove many of the restrictions surrounding commercial drone flight, but they require trained operators fly under certain conditions, always within line of sight and never over people. The rules, which are not expected to be enacted until 2016 or 2017, would allow for things like real estate photography of houses and inspections of masts and antennas, but they don’t allow for the type of automated flight in use if Amazon Prime Air—as the company is calling its planned service—ever gets off the ground. “It needs to go further to beyond line of sight and to highly-automated operations,” said Misener. He came back to this topic several times, telling lawmakers that the administration needs to be much more forward looking. The hearing also touched on the issue of privacy. 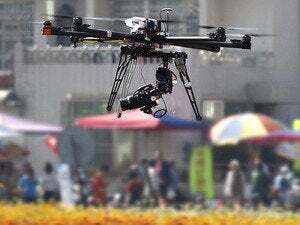 “As the number of flights increase and imaging technology improves, either inadvertently or on purpose UAS will be used to violate privacy,” said John Villasenor, a nonresident senior fellow at The Brookings Intuition. But, he said new laws are not the answer. The privacy implications from government use of drones can already be handled within the boundaries of the fourth amendment while ample trespass laws exist to protect individuals from privately-operated drones, he said. He cited several recent cases where law enforcement agencies had been slapped down for questionable uses of technology.